NiMnSb, an alloy of nickel (Ni), manganese (Mn) and antimony (Sb), is a half-metal. A half-metal functions as a normal conductor for electrons with spins in a certain direction. For electrons with the opposite spin direction, however, the half-metal has the characteristics of a semiconductor. A striking characteristic of the NiMnSb is that unlike usual alloys, the magnetisation is not maximal at the lowest temperature, but at about 90 Kelvin (-183°C). Above this temperature the half-metallic characteristics disappear: both spin directions then contribute to the conduction. Physicists have proposed many mechanisms to explain this unusual behaviour, such as atomic disorder in which manganese and nickel atoms have substituted each other. However, calculations demonstrate that such defects do not affect the half-metallic characteristics. Another explanation, based on strong interactions between electrons (correlation) is not correct either. Experiments have shown that the strength of these interactions is too small to explain the phenomenon. A collaboration has recently been initiated within this programme with the University of Toyama in Japan. There, samples of the NiMnSb alloy have been synthesised under a constant volume, instead of under constant pressure. Consequently, the composition of the material can be much better controlled. Samples produced in Japan do not exhibit the anomaly. The NiMnSb alloy remains a half-metal, also above 90 Kelvin, unless the researchers deliberately add an excess of five percent manganese to the material. Calculations from the programme researchers reveal that this excess of manganese occupies the empty spaces between the atoms, and couples antiferromagnetically with the 'normal' manganese. The antiferromagnetic effect reduces the magnetism of the material. However the link is weak and is lost at a temperature above 90 Kelvin. That explains the maximum in the magnetisation at this temperature. At even higher temperatures manganese loses the order of the moments of the 'normal' manganese as a result of which the magnetisation decreases again . With this discovery the research team has ended a controversy that physicists had worked on for more than a quarter of a century. The researchers worked together with scientists from the University of Toyama (Japan) for the preparation of the samples and with the research team of Jacob Baas and professor Thom Palstra from the University of Groningen for measurements and discussions. 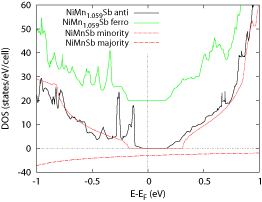 Density of states of pure NiMnSb (red) for electrons with both spin directions (majority and minority). The majority electrons exhibit conduction. The green curve shows the density of states with extra manganese with a ferromagnetic orientation. The black curve shows the density of state for the antiferromagnetic orientation of the extra manganese. This state is the most stable.